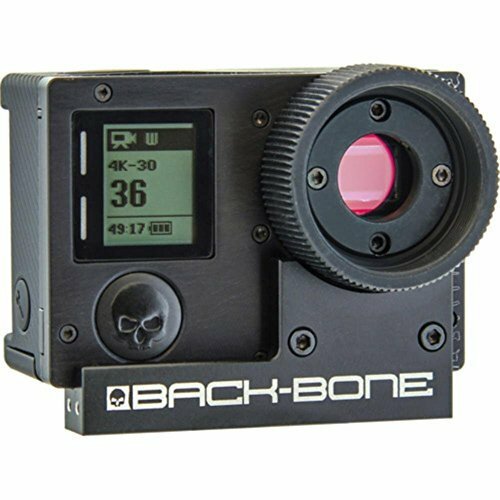 The Back-Bone Gear BBK3 Ribcage Modified GoPro HERO4 Black Panoramic Rig Kit is a ready-made solution for creating panoramic and spherical 360 Degree video. The kit includes One Ribcage Modified GoPro HERO4 Black camera, an Entaniya 280 Degree Fisheye Lens, and an Entaniya One Camera Rig mounting plate. The Ribcage Modified GoPro HERO4 Black from Back-Bone Gear will take your action camera footage to the next level! This HERO4 Black has been modified with an aluminum face plate and removable lens mount system, turning it into a compact, interchangeable lens camera. You can now select the right lens for a given shot and capture 4K Ultra HD (3840 x 2160) video at 30 fps, 2.7K video up to 60 fps, or 1080p video up to 120 fps.. The camera is compatible with widely available M12, CS-Mount, and C-Mount lenses, as well as other types of lenses via optional C-mount adapters. The HERO4’s original ultra-wide lens is included and has been modified for use on the Ribcage. The Entaniya 280 Degree Fisheye Lens is designed for use with Ribcage Modified GoPro cameras, delivering a 280 Degree (horizontal) x 280 Degree (vertical) angle of view on the GoPro’s 1/2.3″ sensor. By outfitting modified GoPro cameras with such a wide-angle lens, you are able to create 360 Degree video and stills using fewer cameras, letting you reduce the size and complexity of your rig and simplify the stitching processes. The lens includes a CS mount adapter, IR cut filter, bolts, and an Allen wrench The Entaniya One Cam Rig is a bracket plate designed for mounting a Back-Bone Gear Ribcage Modified GoPro on its back, allowing you to capture 360 Degree x 280 Degree panoramic videos and photos when equipped with an Entaniya 280 Degree Fisheye Lens. It features a single 1/4″-20 mounting thread and includes two screws for camera attachment. The Back-Bone Gear BBK3 Ribcage Modified GoPro HERO4 Black Panoramic Rig Kit is a ready-made solution for creating panoramic and spherical 360 Degree video with your action camera. The Kit includes 1 x Ribcage Modified GoPro HERO4 Black, 1 x Entaniya 280 Degree Fisheye Lenses, 1 x Entaniya One Camera Rig. All Original Go Pro Accessories and 1x custom GO case. The Entaniya One Cam Rig mounts a Back-Bone Gear Ribcage Modified GoPro on its back – for capturing 360 Degree x 280 Degree panoramic shots when equipped with an Entaniya 280 Degree Fisheye Lens!